Work has been progressing over the past few weeks with various meetings with relevant parties, co-ordinated by Sarah Smith. 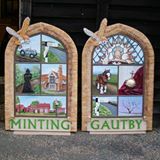 One change is that the initial research part of the project will now be done as part of the Minting, Gautby and District Heritage Society instead of the parish council. The group hope to have more news in October. The pub is now closed until further notice.